The Tool Properties view contains the most common options and operations related to the currently selected tool. When you select a tool from the Tools toolbar, the Tool Properties view updates. 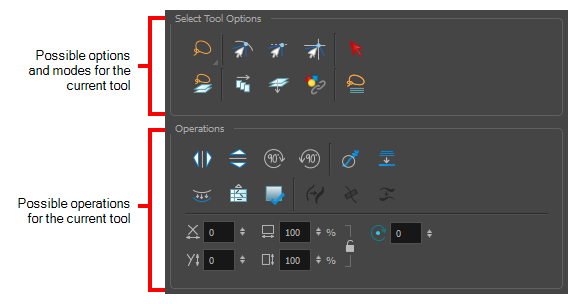 For example, if you choose the Select tool, the Tool Properties view will display the options and operations related to it, such as Snap to Contour, Apply to All Drawings, Flip Horizontal, and Flatten. NOTETo learn more about the options appearing in the Tool Properties view, see Tools Properties. From the top menu, select Windows > Tool Properties. From any of the other views, click the Add View button and select Tool Properties.